The Innovation Center is a non-profit think tank. Since 1990, the Innovation Center has been helping individuals and organizations discover and launch their future through creativity and innovation. The Innovation Center is a 501(c)3 not-for-profit corporation funded by grants, private businesses, and public sources. 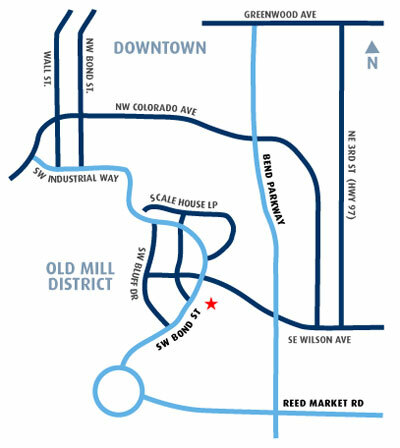 Our facilities are located in the heart of the Old Mill District. Off at Reed Market (head west). Right at first roundabout, onto Bond. On right, at corner of Bond and Wilson. © Copyright 2005, Oregon Innovation Center, all rights reserved. “Innovation Center”, “Powered by Innovation”, and “6P Innovation” are registered trademarks of the Oregon Innovation Center. “iBox”, “i2F”, “Innovate to the Future”, and “Free Radicals of Innovation” are trademarks of the Oregon Innovation Center.